The environment, it’s exploitation and climate change and the global response it requires. Sovereign debut levels….. of poor countries. Maternal health AND family planning. The rights of women and minorities in discriminatory cultures. The many diseases that disproportionally affect poor countries. Issues I couldn’t care less about include “Who’s streets are who’s” and who started the fire, you or the police cruiser. My presentation went really well. I appreciated all the positive feedback in the session and via Twitter. 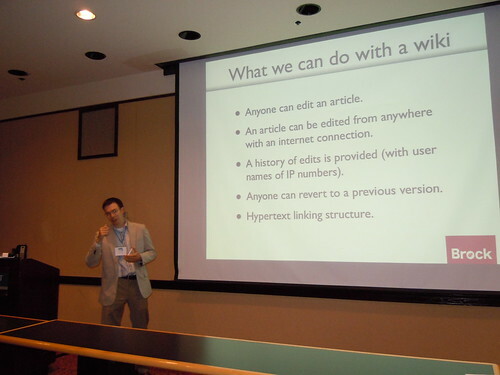 During my presentation I warned the individuals in the room that “your faculty are Google’ing Sakai help and ending up at our wiki right now because MediaWiki has such good SEO”. After the session someone confirmed that a faculty member had indeed told him that he found help for “this Isaak, but it worked with Sakai”. I might post some of my notes and reflections here later. Ron MacLean jumps into the Delaware river to save a man while Don Cherry stands on shore and signals rescue aircraft with his jacket. Ron MacLean was able to rescue that guy because he is used to working with dead weight. Ron MacLean was able to be cool under pressure because he’s used to working with the man beside him complaining that he’s running out of time. Run MacLean asked the man he pulled out of the river in Philadelphia if he received a “brotherly shove”. The man asked to be thrown back. Run MacLean saved this mans life, but he was trying to take his life. Bud Selig, commissioner of Major League Baseball, has ruled “too bad” he still has to die. You are currently browsing the iMatt :: The Blog of Matt Clare weblog archives for June, 2010 .